The beginnings of the Unst stole from Heirloom Knitting. This is turning out to be one of the most challenging projects I’ve attempted. Two things contribute to the challenge. 1. Teeny tiny yarn on teeny tiny needles (cobweb wool on size 1’s). Of course, those of you who know me know that I love little yarn on little needles. But this makes the alpaca cloud on size 3’s seem like rope knitted with fence posts! 2. There is pattern on every row. That means you actually have to pay attention on every row rather than every other row. Dang! No “rest” rows! And because you are doing decreases right above previous decreases, there is not the “give” that a plain knit or purl provides. Of course, if you drop a yo, there’s no where for it to go and it’s pretty easy to pick up. I will, however, admit that it’s getting a little easier as I go along. But it does make me reconsider whether I will ever do the Wedding Ring shawl, which is done with even tinier wool on even tinier needles. 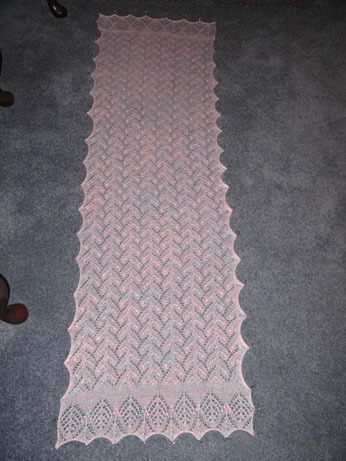 I have decided that there is no way that this can be my only lace knitting. I just can’t work on it more than about an hour without my eyes and fingers screaming for mercy. So, I have ordered the pattern for Peacock Feathers and several varieties of yarn from KnitPicks – several colors of Shadow, 3 skeins of dyeable lace (although I don’t think I’ll dye it) and just for good measure some of the solid sock yarn just because I’m always trying to convince myself I will actually knit more socks one day, but know that I just like collecting sock yarn. I also recevied my copy of the bookbook. It’s just as good as the last. I feel that I have found a kindred soul! I read the introduction to my husband and he said, “That sounds just like you!” I also dialed the 877-SOS-KNIT number. Way cute. Option #3 is my favorite. I made my husband listen to it and he did – all the way through. What a trooper! I hope he paid attention!! 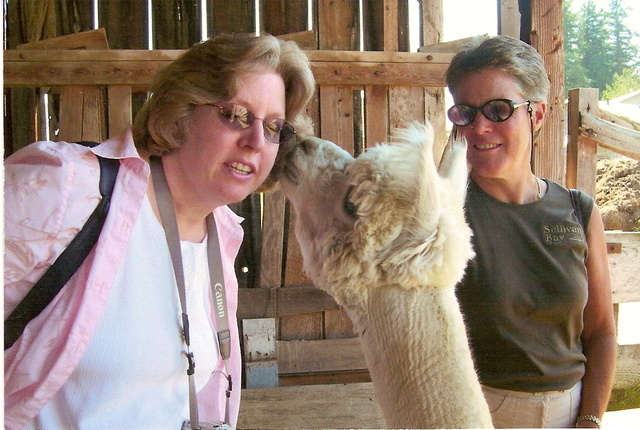 And just because I have no further knitting pictures to share, how about a nice Alpaca Kiss? This is Bambino – I think he likes me! I realized too late that I didn’t get a “before” picture. 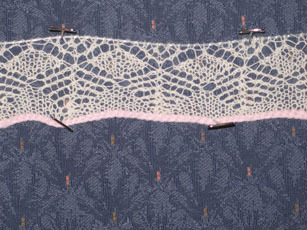 Too bad, because it’s such a treat to see how blocking really brings out the beauty of lace. But this puppy was on the floor being blocked about 10 minutes after being finished. The pattern calls for the edges to be blocked out in points, even though they are knitted straight. I wasn’t going to do this but decided I was too lazy to thread blocking wires through the edges. But I think I like it this way. It’s probably not quite as large as the original pattern – I think my gauge was a tad smaller. Did I do a gauge swatch before? You’ve got to be kidding! But I was so tired of nupps, I just did the suggested number of repeats and quit! I DID NOT like having to graft the second border on. I much prefer a provisional cast on, knit the border outward, then pick up and knit the other direction. What’s up next? The 5th Estonian scarf needs to finished – drat, more nupps! And Izzy’s Christmas sweater is progressing nicely. This next week will be really busy with an exam, a paper, lots of reading for class and getting ready for Ben & family to arrive. Only a week from Saturday!! Woo hoo!!!! All the visas have been acquired, tickets bought, transportation arranged. Now they’re just down to divesting themselves of anything that can’t be carried on the plane. Minimal living, to say the least! I couldn’t even get my yarn stash on a plane! Well, maybe the yarn, but not the books! Given a choice, I’d take the books. I may treat myself this week to doing a gauge swatch (yeah, I know) for the Unst Shawl from Heirloom Knitting, which will be my next lace project. But I have promised myself I will not cast on for it until I finish the Estonian Scarf. I know, you’ve heard THAT song and dance before. Before the game we sat in the Qwest Field center watching the crowds and having a great time. My favorite was the little old lady standing on a chair in her Cougar gear singing along with the marching band – she knew ALL the words to the fight song! Or was it the little 2 month old baby in his Cougar outfit? His dad was all excited that this was his first Cougar game. You gotta know – this school has spirit! And I met an elderly gentleman who bragged that he was still a Cougar – class of ’52! 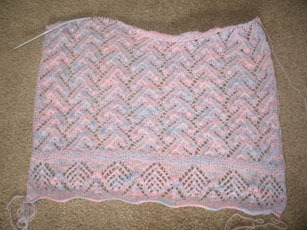 On the knitting front – I’m coming down to the wire on Madli and may actually finish her this week. 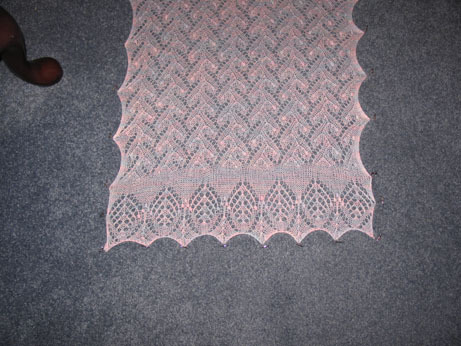 I’m anxious to finish my two lace projects because only then will I allow myself to start the Unst shawl. Izzy’s Christmas present is coming along nicely and should be done in plenty of time (she says with confidence and a just a little bravado). Two weeks from Tuesday I should actually be able to measure her in person! Tomorrow is a big day as they go into London and Isobel gets her passport – officially being recognized as a U.S. Citizen. Way to go Izzy!! Listen – do you hear that? That’s a huge sigh of relief from a mom/mother-in-law/nana. Abby got her immigration visa! If all goes well they will be here in just a few weeks. I can’t tell you how happy I am! It has been so hard to have them so far away. Now we need to get to work. We’ve got to get the guest room cleaned out and ready for my younger son and get the apartment all cleaned up and ready for Ben, Abby & Izzy. At least the time should go quickly with all we have to get done! I am very happy with how she turned out. I know that I usually whine about the fit, but this fits perfectly. And Cascade 220 – what can I say? It is so soft – this will be a pleasure to wear. Wow, two new sweaters in a week. I feel spoiled. And the weather is turning cool enough that I might actually be able to wear them. Of course, knitting for Isobel has gone into high gear. In addition to her Christmas sweater, I have started a larger strawberry hat. That will only be about a couple of evening’s work, though. And you won’t believe this – yes, I have started yet another Estonian scarf. I am a glutton for punishment. My husband and I were talking about giving of our gifts and I decided I would do a scarf for our church’s Christmas bazaar. The proceeds go for both local and foreign missions. This will go in the silent auction portion of the bazaar. I can request a starting bid – what do you think? I’m thinking at least $50 to start with. I know people pay a lot more than that for nice scarves. Besides, we’re going on a road trip this weekend and I needed a portable knitting project. We’re going to Seattle to see the Washington State University Cougars play Grambling. The Cougars only come over to this side of the mountain about once a year (except for Apple Cup and I’m not fighting the crowds for that one!) and as a distance ed student I not only get a free ticket for me, but lunch for me and my guests. So along with my sister and my husband we will go support our favorite team. 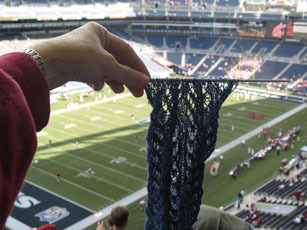 What do you think about pictures of the scarf (ala Yarn Harlot) at Qwest Field? I think I can officially say I am now tired of this pattern. I will probably make one for me down the road, but I think I need to give it a break. A little name dropping here. I met Cat Bordhi today! I was in my LYS and saw a woman with the cutest purse. I said, “That’s a Cat Bordhi purse isn’t it?” She said, “Why, yes it is.” Then my LYS owner said, “By the way, that IS Cat Bordhi.” We ended up having a very nice conversation. She’s such a nice lady. I admitted that although I have her book, I have been a little intimidated by the Moebius cast on. She assured me that it was pretty easy if I just followed the directions. I have a very lovely skein of Alpaca Cloud in Peppermint, so I may just have to give it a try. Madli is coming along quite well – over half done. A Moebius scarf might be a nice transition project before I start the challenge of the Unst shawl from Heirloom Knitting. Speaking of which – I did receive my copy! As I think I mentioned before, a very gracious knitter from my group gave it to me. The olive green Estonian scarf will go to her as thanks. The book is wonderful, although a little overwhelming. However, the time has come to challenge myself, so I am determined to try the Unst shawl. Stay tuned! 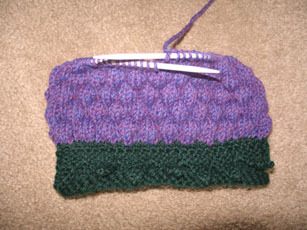 The beginnings of Izzy’s Berry Cute Hat (Fiber Trends pattern by Bev Galeskas). Abby reports that Izzy has outgrown all of her hats and she will need one (or more) for our cold, rainy Washington winter. What, you say? They are in England. But they are moving here!!! I am excited beyond belief. With the grace of God, Abby will get her immigration papers approved soon and they will be here the beginning of October. They were unsure about where they were going to live. We made sure they knew they were welcome here, but quarters are very tight in our house for three extra people and two extra dogs. But our younger son has graciously agreed to move back into his old bedroom and sublet his apartment to them. It’s a winner for everyone – Ben and family get some space and privacy, we don’t end up with four dogs in the house and Allen gets to save up for the computer he desparately wants. And did I mention that Izzy will be right in my own backyard? Well, not actually in the backyard, but you get the idea. The following is probably as political as you will ever hear me get on this site. I have watched with everyone else the horror and tragedy in the South. My heart truly aches and I know that all of you will donate to your favorite relief organization. Our choice is the American Red Cross. I know they are not perfect, but without fail they provide relief not only in the U.S., but all over the world as well. My husband teaches Disaster Preparedness classes for the ARC. He constantly comes home shaking his head at the people who tell him outright that they don’t think they need to be prepared because someone will come to their aid. What they don’t understand is that relief takes time. It is very, very difficult to get relief into an area when the infrastructure is shattered. Roads are impassable, bridges are out and even planes can’t land because of cracked runways. There may be blame to lay over the slow response in the South, but none of us know because we are not there. It saddens me that so much effort will be expended in pointing fingers and placing blame. Instead of that, let’s each of us commit to taking personal responsibility for preparing our families for disaster. Have on hand a minimum of 3 days food and water for each member of your family. I realize that for those in New Orleans this might not have helped because their homes were 10 feet under water. But there are many other scenarios where it will help, and if you are prepared, you are providing a solution for the problem, not becoming a part of it. If you are not sure how to go about getting prepared, this website should point you in the right direction.